Ortery has launched a new office machine called 'Photosimile' or what it claims to be the world's first 3D product photography machine. 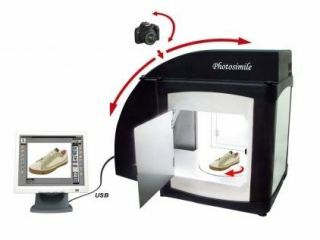 Photosimile is effectively a photocopier that creates virtual 3D replicas of whatever small artifact you like. Or animal (providing they sit still while the machine spins them around 360 degrees, that is!). Ortery's Photosimile 5000 system a PC-controlled desktop photography studio comprising a light box, a DSLR camera, an automated camera positioning device and dedicated workflow software. Ortery's new desktop studio systems allow you to create professional-looking product photos for use online (as 3D animations, if you so wish) or in print. The Photosimile 5000 software does all the work for you - controlling the studio, camera location, turntable movement, camera settings, picture taking, and post processing. Pop your shoe (or whatever you like, really) into the light box and let the Photosimile software do the rest. Ortery's system makes use of four daylight bulbs providing 6500K illumination, a Canon DSLR mounted on a mechanical track, an Ortery turntable and can shoot up to 72 pictures per 360-degree rotation, from zero through to 90 degrees. Your pics can then be saved as GIF or Flash files or converted into 3D Microsoft Silverlight animations using Ortery's Real3D format. Ortery's Photosimile 5000 is now shipping at a cost of around US$17000 (£10550).